Three short independent films were screened at the April 2nd, 2007 meetup - "Emo Pill", "Pump & Dump Classic" and "deep Vain". Produced by: Anthony Spadaccini, Benjamin P. Ablao, Jr. Cast: Timothy Farmer, Steve Brown, Anthony Spadaccini, John Larsen, Denise Smiley, Valerie Thomas, Jeff Watson, David Boleslawski, Jr.
A teenager on the verge of suicide finds solace, and delusions of a happy home life, in the form of a mysterious pill found on his night stand. Starring L.A.-based filmmaker Timothy Farmer, making his acting debut as the troubled teenager Miles Nelson. Last year, Farmer directed Academy Award-winning actor Philip Seymour Hoffman in a short film called 'Simply Leon.' Most recently, Farmer was featured on Access Hollywood, one of television's leading entertainment news shows. Anthony Spadaccini is an award-winning filmmaker from Northern Delaware. He was born April 14, 1982 in Wilmington, Delaware to local Christian folk musicians Melissa & Louis Spadaccini. Growing up, Anthony created fictitious radio shows using his cassette recorder with his sister Rebecca. In his teenage years, despite being in the aviation vocational shop at his high school, Anthony knew he was destined for the world of cinema. He left home a couple of months after turning 18 and struggled for a couple of years to regain his footing and refine his talents. His short film "The Troubled Interviewee," shot in 2002, gained some recognition on iFilm.com in August 2004, when it ranked ninth on the website's most viewed comedy shorts for the month. This hilarious mockumentary depicted an incompetent film student's random interview with a troubled teenager. In 2005, Spadaccini got serious with his hate crime drama "Unstable," the first of three films in a series Spadaccini called "The Film Truth Collection." This documentary-style cinema verite film depicted a hate crime and the effects on its characters. "Unstable" has gained some critical admiration and made its U.S. festival debut at the 2006 Newark Film Festival (having already premiered in Canada at the Indie Can Film Festival in Toronto earlier that year). Since then, Spadaccini has written, directed, and co-starred in two followups, "Aftermath" (a saddening story of HIV) and "Hatred" (a direct followup to "Unstable"). All three films have been recognized as hard-edged underground exercises in realism. Spadaccini's short film "Monday Morning" was an official selection at the Action On Film Festival, Cleveland Micro Fest and Bryn Mawr Film Institute in 2005 and the Indie Can Film Festival, Estes Park Film Festival, 2nd Indie Can Film Festival, and Delaware Valley Film Festival in 2006. It also won second place for experimental shorts at the Indie Gathering Film Festival in 2006. The hysterical comedy short was a tribute to the early 1900s Chaplin / Keaton silent classics and depicted a slacker's morning from hell as he struggles to make it to work on time. Due the popularity of "Monday Morning," Spadaccini recently shot a followup, entitled "The First Date," which follows the same bumbling character as he turns a date with a beautiful woman into a total disaster. "Emo Pill" is Anthony's latest short film, a surrealistic venture into the world of depression, as seen through the eyes of an emo teenager. 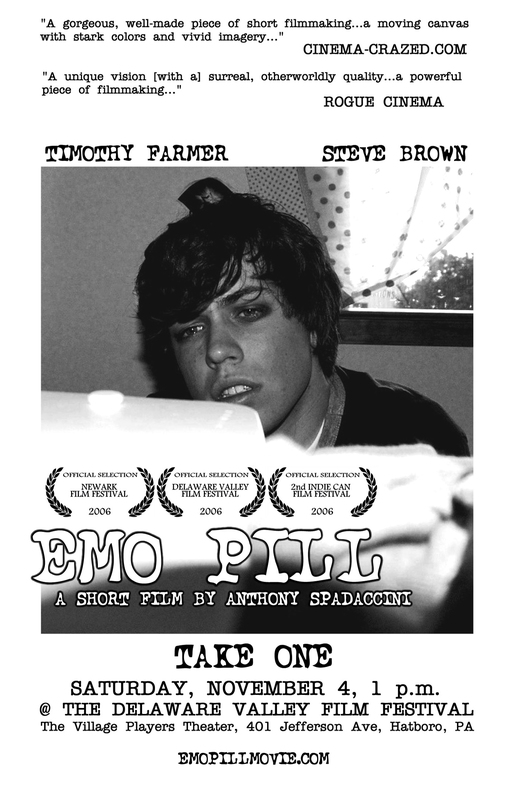 "Emo Pill" is one of the first films to deal with the emo scene in an honest and sincere tone. The film made its world debut at the 2nd annual Newark Film Festival in September 2006, also playing at the Delaware Valley Film Festival in November 2006, and premiering in Toronto at the 2nd Indie Can Film Festival (also in November 2006). Spadaccini won exemplary filmmaking awards for both "Emo Pill" and "Monday Morning" at the 2006 Delaware Valley Film Festival. Spadaccini recently has decided to split time between directing and acting. He recently starred in two films by award-winning Cleveland filmmaker Johnny K. Wu: Swedish artist Bimbo Boy's "Drama Queen" music video and the horror short "En Passant." He also recently made a cameo in Wu's feature length sci-fi epic "The Rapture" and has a co-starring role in Dave Wascavage's sci-fi horror film "Infinities Lock," currently in post-production. Also currently in production is Anthony's feature film "Head Case," a pseudo-docuhorror edited from the video diaries of serial killers Wayne & Andrea Montgomery. Two fraudulent stockbrokers battle over who can stoop the lowest to get a bonus. Stuart Browne was born in 1977 in Montreal, has lived in the Philippines for one year as a Business Development Officer, and is currently living in Toronto. He received a Bachelor of Commerce in Entrepreneurial Management in 1999 and is now working as an Export / Brand Manager for Browne & Co. Stuart is also a Talk Show Host / Co-Producer for TorontoTV, and a Writer / Director / Producer for his own independent film productions. His filmmaking career includes his short, dark, dramatic comedy Pump & Dump Classic, and a number of documentaries, such as his Seduction Secrets Series. Philippe H. Bergeron was born in London, UK and grew up in Quebec City. After studying Architectural History at the University of Toronto, he moved back to London for six years where he wrote, directed and produced deep Vain, his 4th short film. (His 1999 short Acid Freaks was a minor cult hit in Saskatoon). Phil currently resides in Toronto where he works for MTV Canada in post-production. His current project is a feature script about a man who, sensing a bad omen, travels back to Toronto from Europe on an industrial ship instead of by commercial air travel.